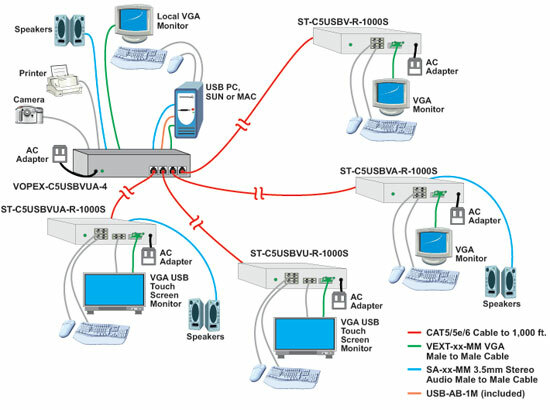 The VOPEX� VGA USB KVM Splitter/Extender allows up to eight remote users (8 USB keyboards, mice, and VGA monitors) to access one USB computer (PC, SUN, MAC) located up to 1,000 feet away using CAT5/5e/6 cable. Audio can be broadcasted to self-powered stereo speakers at the local unit and each remote location. The VOPEX VGA USB KVM Splitter/Extender system has two components: the VOPEX-C5USBVUA-x broadcast unit (sold separately), which connects to a computer and provides local keyboard, monitor and mouse connections; and an XTENDEX� ST-C5USBVUA-R-1000 remote unit for each remote monitor, keyboard, and mouse. The units are interconnected by CAT5/5e/6 cable. Industry-leading ultra-high resolutions up to 2048x1536. Easily expandable. Add remote units as you add users. Supports DDC emulation and mixing. DDC mixing provides a table of resolutions that are common to each connected monitor). Automatically adjust video quality and color skew for crystal clear video with longer cables. Optional support for remote USB touch screen monitors, CAC card readers, or interactive whiteboards.